SALT LAKE CITY - Jon M. Huntsman, Sr. was a visionary philanthropist who made it his personal mission to eradicate cancer from the face of the Earth. He often described his devastation after the loss of several family members and close friends to the disease. In the 1990s, he received his first of four cancer diagnoses. His personal experiences with cancer ignited a determination to make a difference. After he completed treatments, Huntsman and his family vowed to use their considerable means to transform the experience for cancer patients and to advance research. Vision began its course to reality with the founding a cancer center that would bear the Huntsman family name. Located on the west side of the original HCI research building, the feature was Huntsman’s idea. 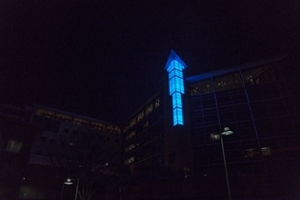 In 1999, as construction of the building was near conclusion, Huntsman shared his idea of a light emanating from the cancer center that would reflect HCI’s commitment to push forward cancer research and provide exceptional patient care. The light feature became known as the Beacon of Hope. Due to limitations in technology available two decades ago, the lighting feature was not continuously lit as originally intended. HCI began renovation on the Beacon of Hope in January 2018. It was briefly lit after Huntsman’s passing last year at the age of 80. Over the past twelve months, further improvements were made to update the installation with energy-efficient lighting panels. The new Beacon of Hope has 61 individual lighting panels embedded with pixel LED lights, each with an operating life of 30 years. Each panel is five stories high. Renovations to the feature were completed under the direction of Jacobsen Construction, Next Generation Lighting, and Architectural Nexus.